As it had threatened during last fall’s election campaign, the newly-elected Coalition Avenir Québec (CAQ) government has introduced legislation to prohibit a wide range of persons “in authority,” including teachers, from wearing symbols of their religious beliefs while exercising their functions. Those affected include judges, prosecutors, police, and jail guards, but also teachers, childcare providers, public transit operators, health and social service workers, municipal and administrative tribunal and board officials, etc. Bill 21, “An Act respecting the laicity of the State,” also provides that those delivering or receiving government services may lose their jobs or be denied services if they refuse to uncover their face for identity or “security” reasons. Similar provisions, adopted under the previous Liberal government but suspended pending a legal appeal, will now be implemented pursuant to the CAQ’s decision to shield its legislation from civil liberties challenges using the constitutional “notwithstanding” clause. Prime targets of the legislation are obviously Muslim women wearing headscarves or other clothing they associate with their religious beliefs. A “grandfather” clause exempting employees in their current jobs would effectively bar them from promotions or other public employment. The government bill – with its racist connotations – comes in the wake of the murder of six worshippers in a Quebec City mosque in January 2017 and the recent massacre of 50 Muslims in Christchurch, New Zealand by right-wing racists, and is consistent with the pattern of reactionary scapegoating of minorities increasingly practiced by many government leaders in the major capitalist countries as they heighten austerity and restrict immigration. 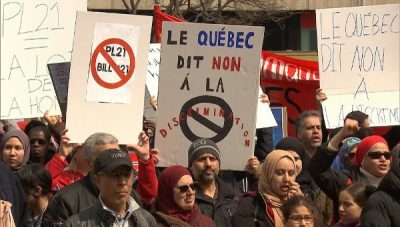 Bill 21 is supported by the Parti Québécois (PQ), which had earlier, when in government, sponsored a widely-criticized “charter of values” with similar provisions that the PQ had hoped would win the support of Québécois apprehensive at the changing pluricultural face of Quebec society and fend off pressures to integrate ethnic minorities through more effective French language training and affirmative action in employment. The bill is opposed by the opposition Liberals and by Québec solidaire (QS), now the second party of opposition in the National Assembly following the defection of a PQ member. Québec solidaire has a mixed history on these issues. It is now almost 10 years since the party adopted its position on laicity (or, as it is more commonly known in English, secularism). It made a clear distinction between the need for state neutrality toward religious belief or lack of belief, and the freedom of individuals “to express their own convictions in a context that favours exchange and dialogue.” It would allow “state agents” (employees or officials) to wear religious insignia such as a crucifix or hijab. However, the program would also remove this right from those whose clothing was deemed to promote religion or interfere with their duties or safety standards. And in subsequent years QS leaders, drawing on these hypothetical caveats in the party’s program, began adapting to other parties’ attempts to impose dress codes not only on state employees but on citizens from minority ethnic communities. In a previous article, I cited several such instances involving QS members of the National Assembly. The relevant account is excerpted in an appendix following this article. The CAQ bill has provoked a growing wave of public opposition from civil liberties groups, school boards, and some unions. Meanwhile, many Québec solidaire members had expressed unease with statements by newly elected QS members of the National Assembly indicating support for a “compromise” that would adopt the Bouchard-Taylor report’s position. The party opened a discussion on the issue, which was placed on the agenda of a National Council (NC) meeting held March 29-31. Three positions emerged from this debate. A relatively small “laicity collective” called for a complete ban on religious signs by public employees at all levels. Because this proposal conflicted with the party’s program, it was ineligible for debate at the CN meeting, which was confined to “interpreting” the program and had no authority to pre-empt a position adopted in a duly constituted membership congress. A second position – endorsed by several internal QS commissions and ad hoc collectives – rejected the MNAs’ compromise and supported a position of “open laicity” that generally rejected any prohibition on display of religious beliefs by public employees. The National Council meeting voted overwhelmingly in favour of Option B. However, this was followed by a second vote, also proposed by the party executive, which asked NC members to choose between two options: one that would bar those dispensing or receiving government services from wearing clothing that conformed to any of the four exceptions allowed by the party program; and another that would allow such services to persons wearing clothing that covers the face, “except for considerations of identification or safety.” The latter option was adopted. This position, which in practice would affect the tiny minority of Muslim women who wear a niqab or burqa, moves QS uncomfortably close to the discriminatory positions of the CAQ, Liberals and PQ on this aspect. So in the end the party program on “open laicity” as it is often called, was reaffirmed, albeit with its explicit limitations, while the MNAs’ attempts to find some compromise with opposing positions were largely rebuffed. However, it remains for a party congress to amend the QS program to remove the caveats that have served as a pretext for the slippages of principle that have characterized the party’s public positions over the past decade. In other decisions, the 330 NC members voted to continue making the party’s program on climate change its main campaign for the coming year. That program, which presents many progressive concepts but within the framework of a general “green capitalism” approach, should also be the subject of critical analysis along with the position on laicity as the party prepares for its next convention, to be held toward year-end, and where it plans to complete and review its program as a whole. Excerpted from “Québec Solidaire Prepares to Confront a New Government of Austerity and Social and Ethnic Polarization,” October 23, 2018. Quebec’s new premier, François Legault, threatens to implement as a priority the CAQ’s plans to prohibit the wearing of “religious signs” among state-employed persons in positions of “coercion” (cops, prosecutors, judges and jail guards) or “authority” (including elementary and secondary school teachers, and perhaps others). While these caveats were problematic, QS leaders in subsequent years went further and began adapting to other parties’ attempts to impose dress codes not only on state employees but on citizens from minority ethnic communities. In 2011, the sole QS member of the National Assembly, Amir Khadir, voted with the other parties for a PQ motion to ban Sikhs from entering the legislature because their ceremonial kirpans were to be deemed “weapons.” Ironically, the motion was prompted by an incident a month earlier when four members of the World Sikh Organization were turned back by security guards when they came to testify to a parliamentary committee in favour of the right of Muslim women to wear face coverings when receiving government services – which a Liberal government bill then under debate would have denied. Although in 2017 the three QS MNAs voted against the Liberal government’s Bill 62 prohibiting citizens from wearing face coverings when receiving or dispensing public services, they called instead for adoption of a “genuine” charter of secularism. QS leader Gabriel Nadeau-Dubois said their position was a “compromise”that takes a harder line than the Liberals in that it would bar people who wear overt religious symbols such as turbans and hijabs from working as judges, jail guards and cops. These positions, which clearly violate the QS program adopted by the membership, have prompted a number of protests from defenders of civil liberties, including a very strong “Open Letter” addressed to the party by a number of QS members including prominent human rights lawyers. Unfortunately, during their swearing-in on October 17, the new QS MNAs told reporters that they intend to support the “compromise” that would ban religious signs for persons in authority. But at least one – Catherine Dorion, representing Québec-Taschereau – said later she was not really sure what her position would be. These issues should be on the agenda of the QS National Committee meeting, now scheduled to take place December 7-9. The party’s reaction to Legault’s forthcoming legislation will be an early test of the adherence to basic democratic principles of its new parliamentary deputation.